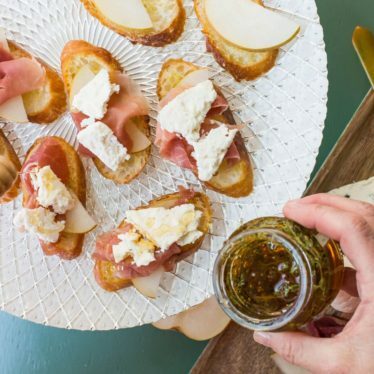 This is the blue cheese you’ve been waiting for. 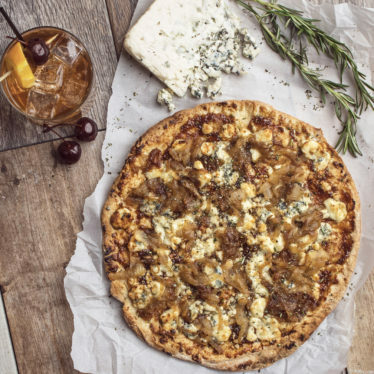 We’ve crafted an exclusive recipe that turns blue cheese skeptics into connoisseurs, blue cheese lovers into diehards. 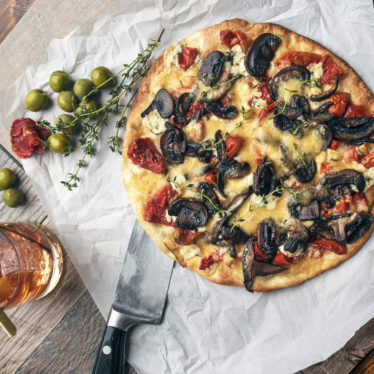 Bold yet restrained, our recipe is handcrafted in small batches with fresh, raw milk from local Holstein and Jersey cows. The result is a family of beautifully balanced blues with a mellow, earthy flavor and soft, creamy finish. 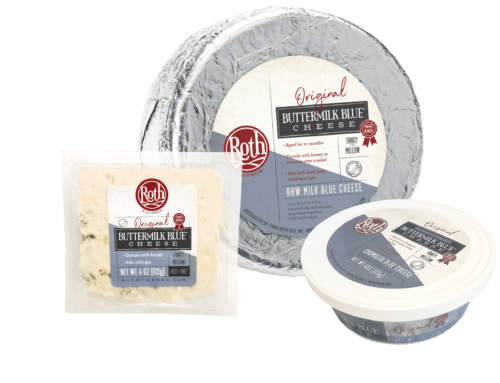 Our flagship Buttermilk Blue® is crafted with raw milk from Jersey and Holstein cows and cellar-aged for 2+ months for the creamiest taste and texture. 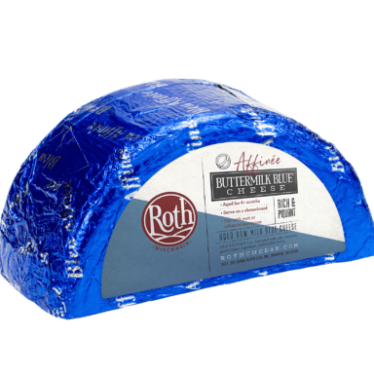 Tangy, yet mellow; this blue is an easy choice for cooking, crumbling or serving on a cheeseboard. Available as: crumbles, pre-packaged, cut & wrap. Nutrition Facts: Serving Size 1 oz (28g), Servings Per Container: Varied, Calories 100, Total Fat 8g (10% DV), Sat. Fat 6g (30% DV), Trans Fat 0g, Cholest. 30mg (9% DV), Sodium 380mg (16% DV), Total Carb. 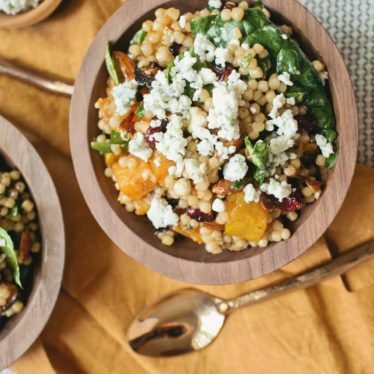 <1g (0% DV), Fiber 0g (0% DV), Sugar 0g (Includes 0g Added Sugars, 0% DV), Protein 6g, Vitamin D 0.2mcg (0% DV), Calcium 148mg (10% DV), Iron .1mg (0% DV), Potassium 25mg (0% DV). * % DV = % Daily Value. CONTAINS MILK. KEEP REFRIGERATED. 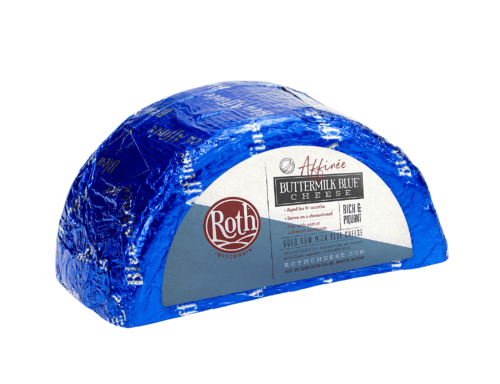 Buttermilk Blue® Affinée epitomizes the indulgent experience of rich and creamy blues. 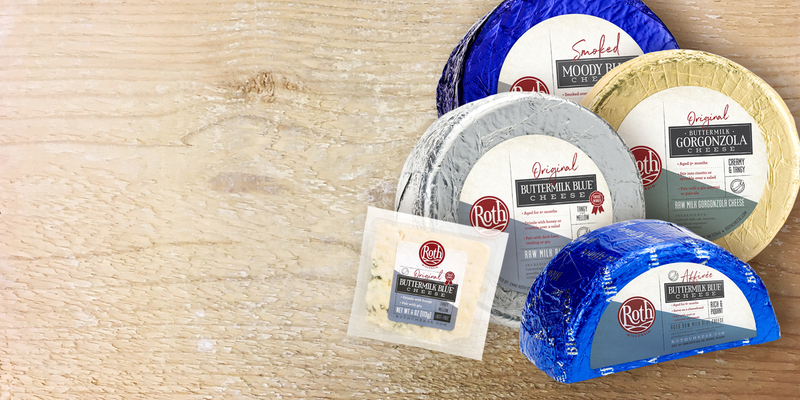 We select just a few of our Buttermilk Blue® cheese wheels to be aged 6+ months to develop a deliciously piquant and earthy flavor. Available as: cut & wrap. 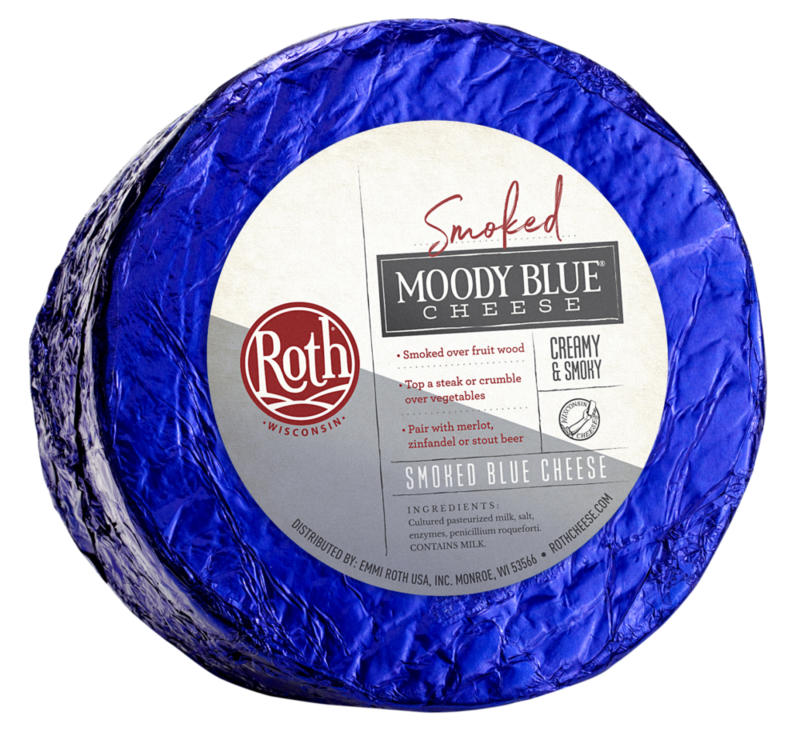 This small-batch blue is delicately smoked over fruit wood to create subtly smoky undertones. 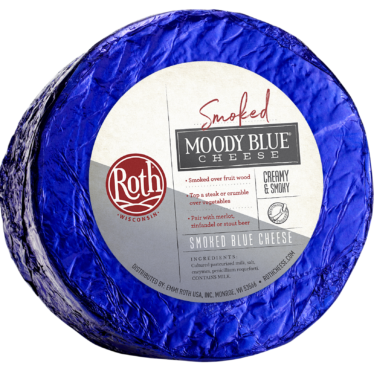 Beautifully balanced and softly seductive, Moody Blue® is excellent on a cheese plate and for cooking with, especially as an addition to creamy condiments. Ingredients: Pasteurized cultured milk, salt, enzymes, penicillium roqueforti. Nutrition Facts: Serving Size 1 oz (28g), Servings Per Container: Varied, Calories 100, Total Fat 8g (10% DV), Sat. Fat 6g (30% DV), Trans Fat 0g, Cholest. 30mg (9% DV), Sodium 380mg (16% DV), Total Carb. <1g (0% DV), Fiber 0g (0% DV), Sugar 0g (Includes 0g Added Sugars, 0% DV), Protein 6g, Vitamin D 0.2mcg (0% DV), Calcium 148mg (10% DV), Iron 0.1mg (0% DV), Potassium 25mg (0% DV). * % DV = % Daily Value. CONTAINS MILK. KEEP REFRIGERATED. 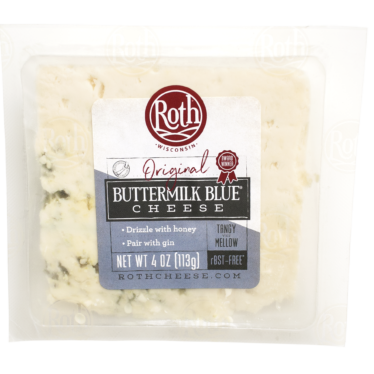 This raw milk Italian-style blue is aged 3+ months for a full earthy flavor and pillowy texture. 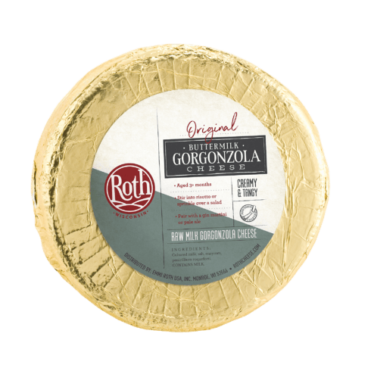 Inspired by the delicious cheeses of Italy, this buttermilk gorgonzola has an assertively piquant flavor and complex, peppery finish that’s not for the faint of palates. Ingredients: Cultured milk, salt, enzymes, penicillium roqueforti.